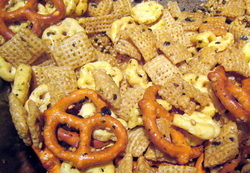 After we ran through our Christmas stash of Big Island Delights super snack mix, my son decided that he wanted to make a furikake chex snacks mix. So he and my husband found this one. Just remember to use the bigger (supermarket-size, not Costco) boxes of cereal. Otherwise you'll end up with a super-salty, oversaturated mix. You can also vary the cereal--Crispix, (plain) Cheerios, Honeycombs, and wheat chex work well. The 'flake' or super-sugar-bomb cereals do not work. At all. You can also add Fritos, pretzels, peanuts or even arare, but we like the cereal-only version. Dump cereal into a roasting pan. Mix butter, sugar, oil, corn syrup, and shoyu over medium heat. Pour over cereal and toss. Sprinkle furikake evenly and mix again. Bake at 250 degrees for 1 hour tossing every 20 minutes to coat uniformly.